Guitarist Mike Stern knows how to creatively blend jazz subtleties with rock bombast better than most musicians. At age 22, he got early lessons with Blood, Sweat & Tears, and he pushed the fusion envelope further in the bands of Miles Davis and Jaco Pastorius. Stern then started his solo recording career in the mid-1980s with a succession of incredible lineups. On his latest DVD, New Morning: The Paris Concert, he delivers a stunning one-night performance with tenor saxophonist Bob Franceschini, bassist Tom Kennedy and drummer Dave Weckl. The 21-minute opener, “Tumble Home,” sets a blistering pace. 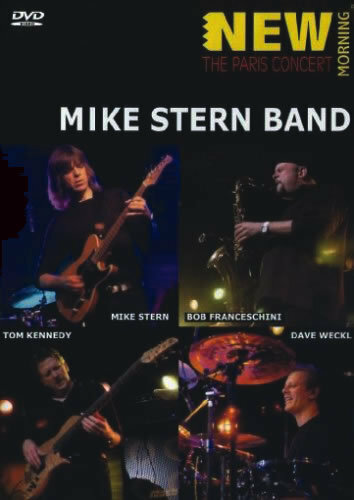 Stern plays a staggered rhythmic intro straight out of the James Brown songbook, and Weckl switches from drumsticks to brushes for the beginning of the guitarist’s simmer-to-boil solo. All four musicians take turns in the spotlight, with the vastly-underrated Kennedy earning top honors (not to mention contributing a percolating bassline). The subsequent “K.T.” is also from Stern’s 2006 release Who Let the Cats Out?, and likewise outmuscles its audio counterpart thanks to Weckl’s polyrhythmic solo over the end vamp. Franceschini’s best playing comes on ballads like “Wishing Well,” on which Kennedy practically functions as a second guitarist with his high-register countermelody. The bassist pulls a similar trick on the second half of “Chatter,” one of the DVD’s epic pieces thanks to Stern’s intro and more vamp soloing expertise by Weckl. Another highlight is “What Might Have Been,” on which the drummer (playing with his hands) and Stern play a cat-and-mouse intro duet. Kennedy brings the piece home with another mesmerizing melodic statement after the guitarist’s moody, unaccompanied middle solo. A bonus Stern interview, about his bandmates and influences, shows the verbal side of the relatively unsung guitar hero.